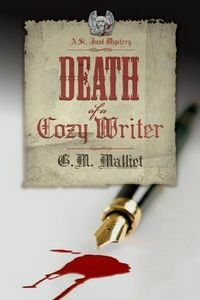 Death of a Cozy Writer by G. M. Malliet: Synopsis and Online Purchase Options. Synopsis (from the publisher): From deep in the heart of his eighteenth century English manor, millionaire Sir Adrian Beauclerk-Fisk writes mystery novels and torments his four spoiled children with threats of disinheritance. Tiring of this device, the portly patriarch decides to weave a malicious twist into his well-worn plot. Gathering them all together for a family dinner, he announces his latest blow — a secret elopement with the beautiful Violet … who was once suspected of murdering her husband.